Recall that the archangel Gabriel had mentioned to Mary that her cousin Elizabeth was pregnant. Remember, we met Elizabeth's husband earlier, Zechariah, to whom the 3 year old Mary was presented in the Temple. Now, Elizabeth and Zechariah, who had prayed all their married life for a child, are old and infirm. By the power of God, Elizabeth is pregnant. So Mary goes to visit Elizabeth and to help her. 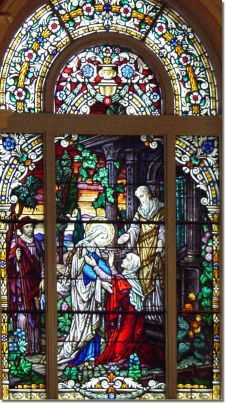 We see in the window that Joseph travels with Mary. When Mary first arrives, Elizabeth greets Mary with the first part of the Hail Mary. Elizabeth says to Mary, "Blessed are you among women and blest is the fruit of your womb." Here we are reminded of the sanctity of life in the womb. Two mothers meet and two babies meet in the womb.